Many people, when they think of Buddha, they think of this rolly polly bald headed man- the Laughing Buddha also called Budai or Pu-Tai (in Chinese & Japanese: 布袋). 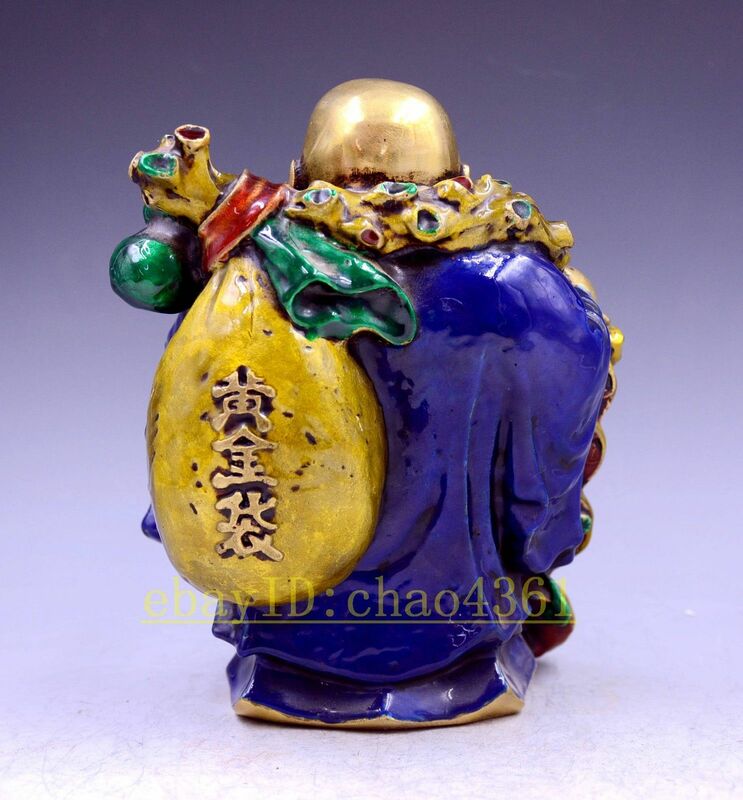 According to Chinese legend, Budai was an eccentric Chán monk who lived in China during the early 10th century. More Chinese than Tibetan, he is believed to bring happiness, and in particular wealth- whose enduring popularity within itself is a reflection of Chinese values. Taken from many a gentleman’s study and Grandmother’s house, these are the spoils of a country bent upon suicide, destroying itself as well as others. There are many, many pendants like the one above or even worse (see photo below)- with dirt and some damage and weathering, which may indicate they weren’t found on living people, but on the dead. 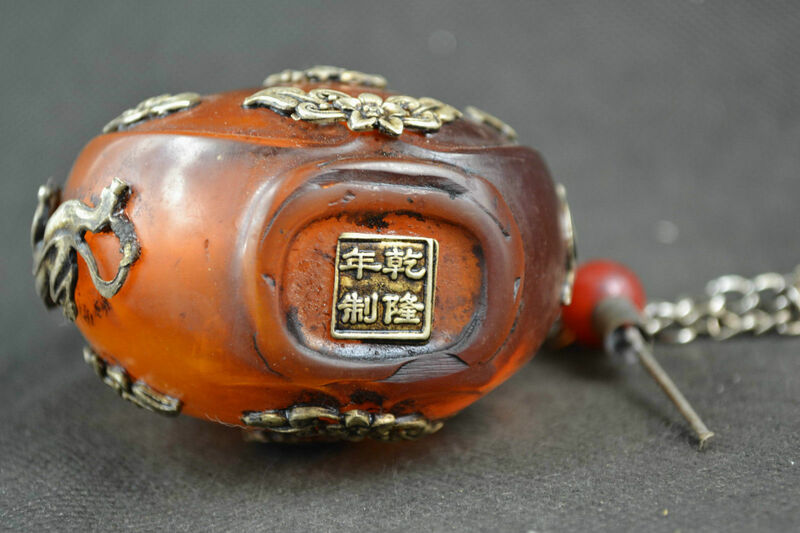 These pendants are a brownish color stone, very poor in quality which were affordable to the masses, are typical of the very poor to wear, and more popular during the Mao era when times were tough and most people didn’t have any money to spend. They may have been taken from graves, specifically from mass graves of people either killed outright or through starvation, and most Chinese people might consider them to be taboo. Most of these old and used pendants are being sold as brand new, though it pretty obvious that they aren’t by the surface wear and dirt, let alone scratches and chips in many- which indicates that something far worse than just selling some old pendants as brand new to make more money from them, especially when they are sold beside other pendants with rocks stuck in the holes and old coins that are all rusted and obviously weren’t in any coin collectors book recently. 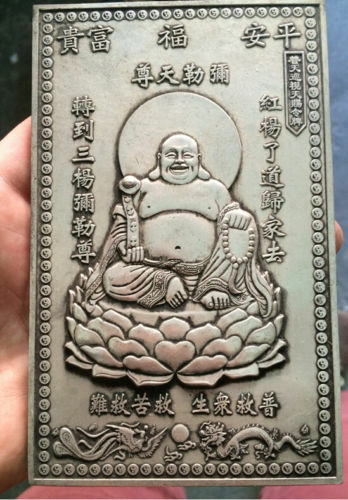 Though the pendant of Laughing Buddha above is being sold as brand new, there is a hole right above his head from being strung there as a pendant before, and has been put into this relatively newer frame later. You can also see some wear marks on Laughing Buddha even in the sellers photos, like specifically on his necklace above. Many of these types of pendants are all being sold out of India, and though it appears to be a number of different shops, they apparently are all being ran by the exact same person, who also likes to lie and say they are sterling silver (.925) instead of being mystery metal covering copper which is what they really are. I found this out after not wanting to take back a feedback comment saying their items were A. used and B. not sterling silver and the shop owner in India harassed me for months by email and even called up my personal telephone number to plead with me to take back my negative feedback on Ebay. But I felt it was truthful and his other customers should be warned. Since then I haven’t been able to buy a single piece of jewelry from this seller and or any other Ebay shops carrying the exact same Tibetan goods in India- which are quite a few- also indicating that these people are all working together if not being one and the same. They did not outright ban me from bidding and purchasing like many Chinese sellers that I’ve left truthful feedback for and then wouldn’t take a bribe for the purchase price of the item to change it to positive, but they just wouldn’t send a couple orders at all, then have a bidder who outbids me every single time if I do bid now. The Chinese Ebay sellers also have illegitimate bidders who bid on items, but it is typically just to raise the price to a minimum that they will sell the item for- not just to get specific bidders out of auctions. Like I said, if the Chinese don’t want you bidding, they just ban you outright as has been the case with me time and again. You can see the list of sellers here who have banned me, most of the time it is because I caught them lying about items that were used and/or broken then they still don’t want to be truthful about it and say they are used, and keep lying. Why would they lie about that much stuff and where does such a volume of used stuff come from anyway? Tibetans aren’t seeing a dime since they aren’t the ones selling it and you can’t talk to them if you tried!! 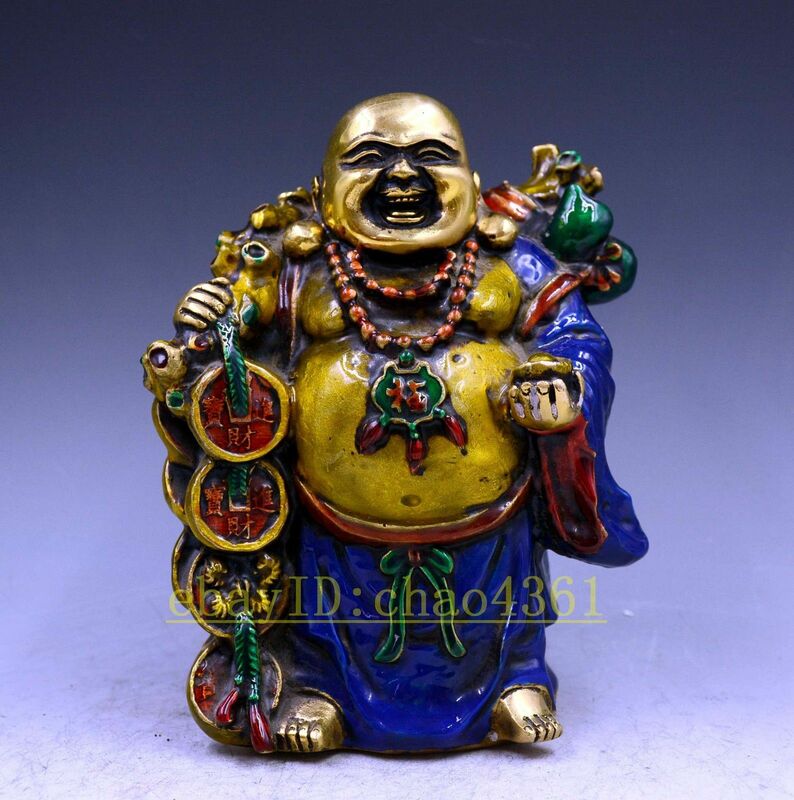 Though the shop that was advertising this laughing Buddha below is supposedly located in America, notice that the pendant- though different from the one above- is placed in the exact same fashion with the exact same flower holding it up. Another indication that these are all the same people working together, not fair or free trade, but an organization of people who also have a monopoly on the goods which aren’t even theirs and they continuously lie about. Though resin, this type of blue is meant to replicate turquoise which would have been far more expensive and not mass produced like these statues. 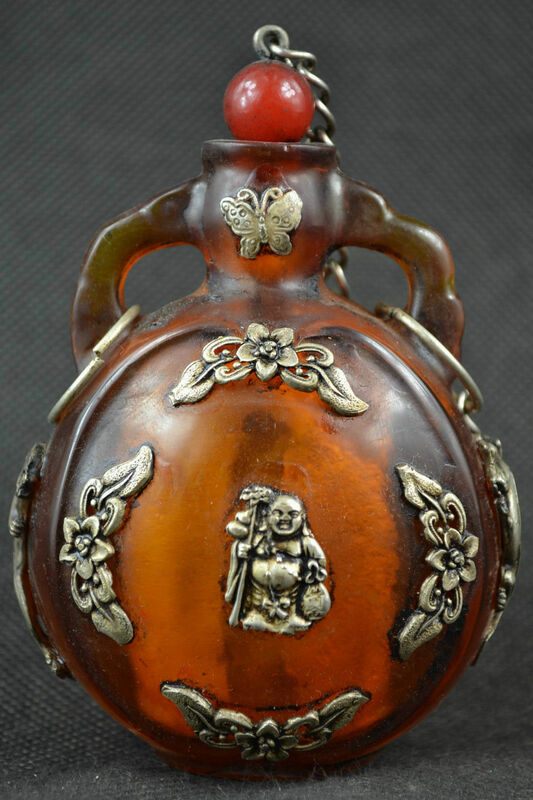 The carving below is probably also a form of resin, but may have real amber mixed into the formula. 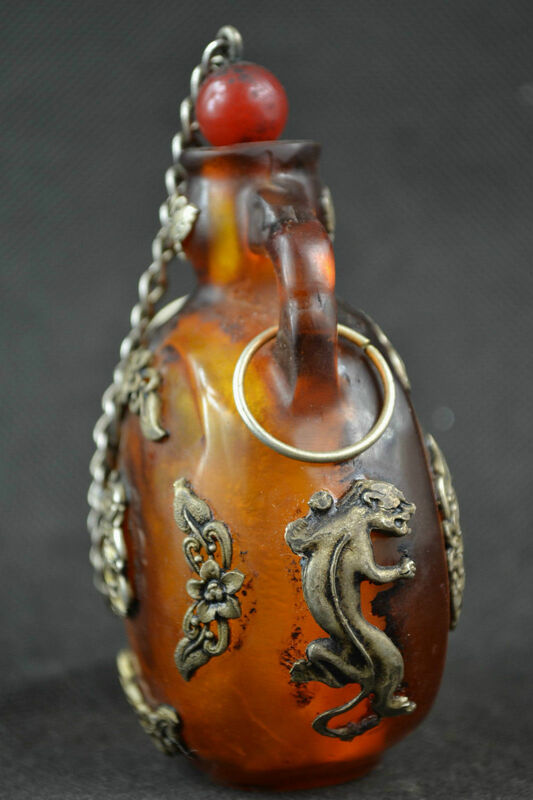 Bracelets and jewelry made from mila amber is common thoughout Tibet and China, and common additives are for coloring as well as to give the amber a pleasing scent. Because all of the sellers are using the exact same photograph it adds to the illusion that all of these are being mass produced today. But these are vintage items, if not antiques by now, and were taken from someone’s home, stockpiled, sorted, distributed, and sold by the world’s biggest criminal organization, the Chinese government who may have either killed the rightful owners of such property, but chances are they just locked them up, enslaved them, and/or at least robbed them mercilessly several times while banning their religious and cultural practices and re-educating their children. Buddha would not be laughing and it is sacrilege on a bigger scale than the world has ever known if you count up every single religious item that has fallen into communist hands. When the British began trading with the Chinese in the 16th and 17th century, silver was the only currency that the Chinese accepted. 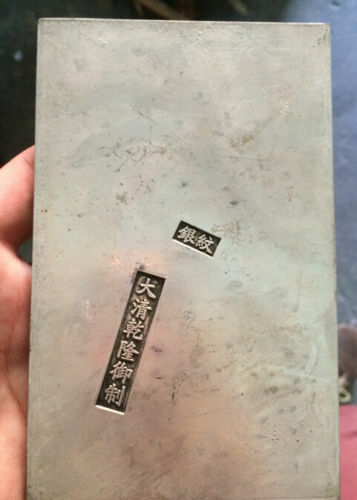 Though these silver plaques are often marketed as silver “thangka” by Chinese sellers, these silver plates may have been used as auspicious money, either as a normal trading currency or for special occasions given as gifts as money is still given in China today. Budai sitting thoughtfully on gourd made from the finest porcelain in the world called Delua porcelain or Blance de Chine. It is made clay mined and fired in Dehua in Fujian province.